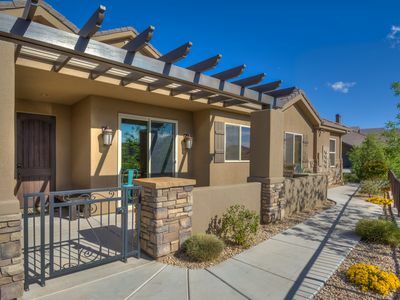 Welcome to the Beautiful Red Cliffs Retreat at Casitas in Sienna Hills! 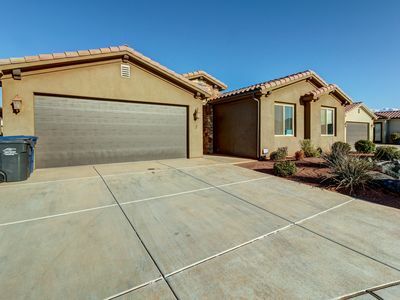 This brand new professionally decorated beautiful St. George, Utah Vacation Home features 3 bedrooms and 3.5 bathrooms. 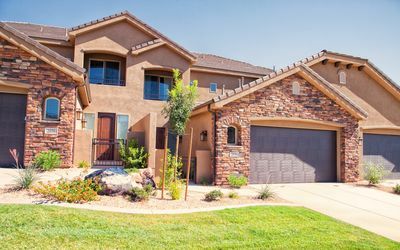 The home is only 32 miles from Zion National Park, home to the famous Narrows, Canyon Overlook, Emerald Pools, Petrified Forest, Desert Swamp, Springs and Waterfalls, Hanging Gardens, Wildflowers, Wildlife and much more! 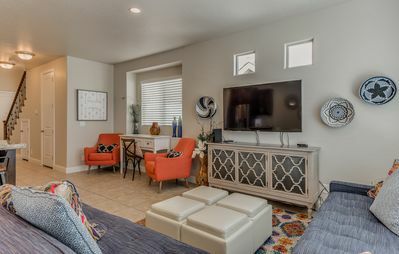 Red Cliffs Retreat features three-bedroom master suites all with private bathrooms and walk in closets in each bedroom. The first Master Suite is located on the main floor featuring a king, 43" TV and DVD Player. The second master suite is located on the 2nd floor featuring two queens, 1 Bunk with 2 Twins and 1 full, 43" TV and DVD Player. The third master suite is also located on the second floor featuring a queen and bunk bed with 2 twin and 1 full, 43" TV and a DVD Player. Also, the home is equipped with fiber optic internet. 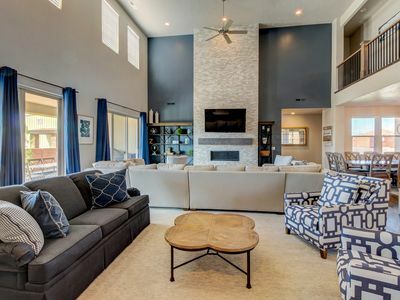 This beautiful St. George Vacation Home has been furnished for ultimate comfort. The mattresses are top of the line to ensure that our guests get a good night’s rest. The living room has a large comfy sectional sofa, DVD Player, Desk and a 60" TV to watch some of your favorite movies! The kitchen is fully stocked with all the comforts of home. 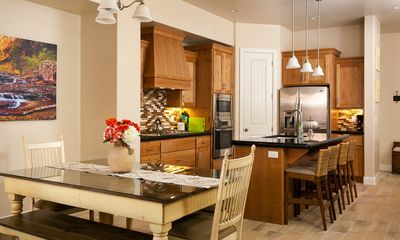 In addition, the kitchen has granite counter tops and stainless steel appliances. 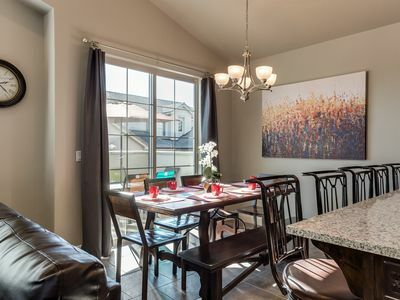 Just off the kitchen enjoy a patio with table, chairs, umbrella and BBQ Grill. Bedroom configurations are 1 king, 3 queens, and bunk beds. We provide all linens, towels, wifi, cable, and supply of bath products. EXTRA’S: Highchair, pack n play, Queen Air Mattress and desk. This home is also an end unit! Close to biking, hiking, sand dunes, Sand Hollow State Park, Zion Natl. Park, Bryce Canyon, Tuachan outdoor theater, Snow Canyon. Coral Canyon Golf Course is minutes away. Enjoy the luxurious golf and experience the breath-taking views. This course is 7,029-yard, par-72 layout. Let us book your tee time! 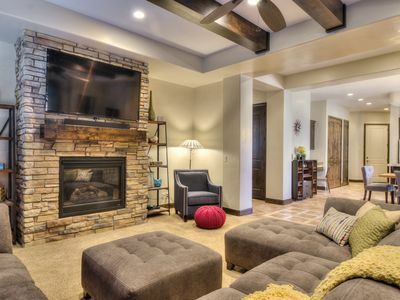 To reserve this beautiful home call us today at 435-703-8161 or feel free to book online. This home is sure to book fast, so don't delay! 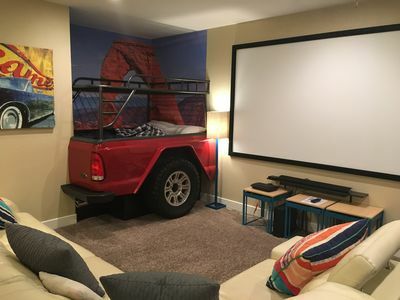 Book Before Jan 31, Save 20% Giant Theater Room. Great Place to Gather! 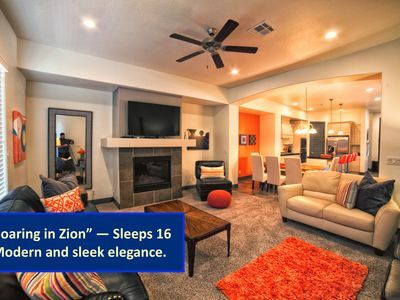 Luxury poolside home w/ shared pool & hot tub near Zion! 2 Master Suites Free Wi-Fi, Pools! 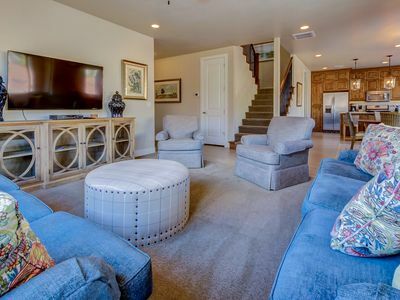 4 BEDROOM! FREE WiFi!